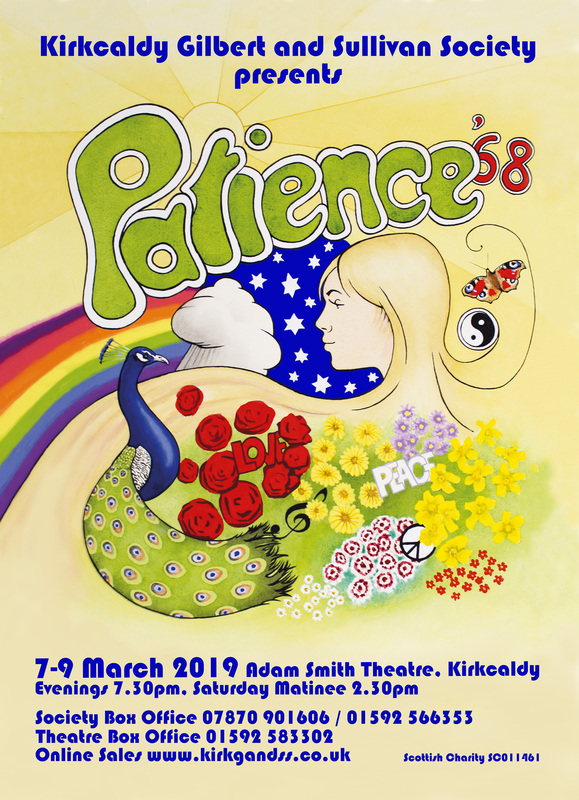 This time of year always provides a feast for the G&S enthusiast, and our friends at Kirkcaldy G&S Society are presenting Patience at the Adam Smith Theatre, Kirkcaldy from 7–9 March at 7:30pm (plus a Saturday matinée). The interpretation has been time-shifted, so that Gilbert’s rival poets vie for the affection of the ladies as they might have done in that ‘Summer of Love’ in 1968. Robin Ożóg directs and also stars as Colonel Calverley, John Allen is lighting the show, and you’ll spot a number of DGASS members in the chorus. The show begins with G&S TV’s Reporter setting the scene for a festival weekend of song lyric writing and … well, come and see what transpires, wearing your old hippy gear if you wish. Click the image for ticket ordering details. We often have a clutch of NODA awards (recorded on this page), but this year just one. Here we see the presentation by Dorothy Johnstone, Regional Representative for District 6 (Edinburgh area), who gave Shan Edgar (fetchingly attired in her costume as Colleen Moore!) her ten-year medal. 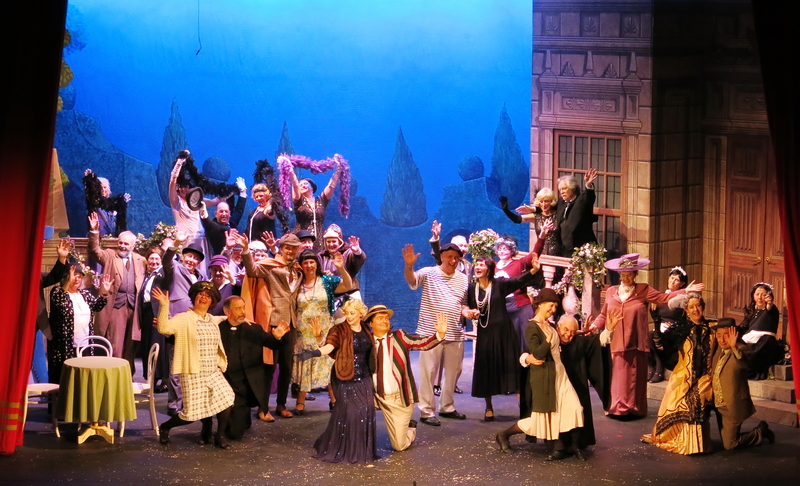 “Really enjoyed the show yesterday – the scenery was lovely and the music and singing a delight.” “Please pass on our thanks to the cast for all their hard work in making this a success.” The same long-term regular member of the Society’s audience also said that she hadn’t remembered seeing the show before, though your webmaster knew differently, having sold the ticket! 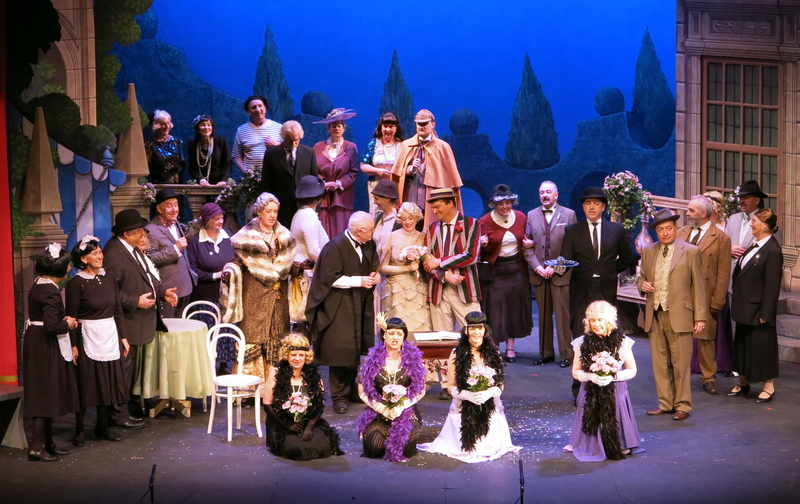 The reason is almost certainly the fresh way in which The Sorcerer was presented in this production, in no small part due to the transformation of the chorus into realistic 1920s individuals, each with a part to play. Such was the extent of the stage magic (for which read imagination, hard work, attention to detail and characterization) that brought this about that our Honorary President struggled to identify more than three or four of the cast, though she has known many more of you for years! 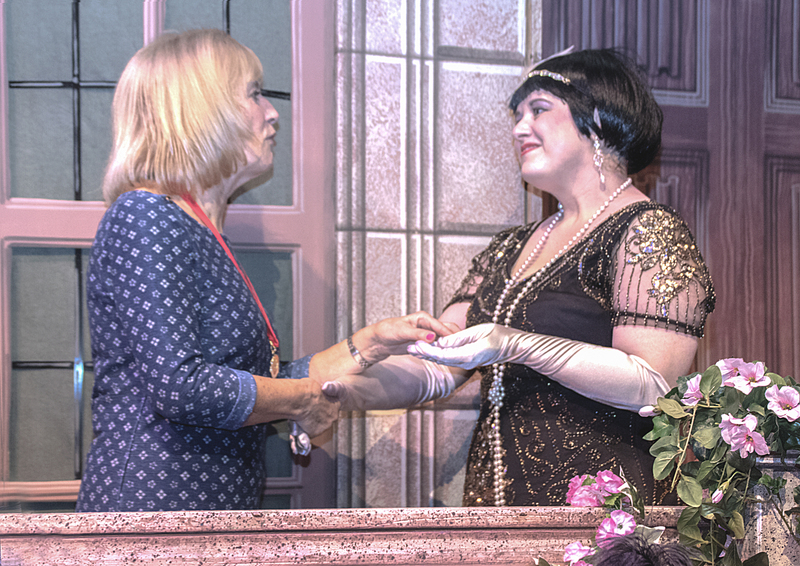 So give yourselves an extra round of applause, especially those who came into the show towards the end of rehearsals: Susan Reid made it into the programme, but Sinead Black’s substitution for Marion Kelly as Miss Marple regrettable didn’t. Neither did Gordon Horne of EDGAS, stepping in for George Shand as Sherlock Holmes within a few weeks of opening night, a feat that rightly earned him the “Lord High Substitute” Frank award, wittily presented in the bar after the final curtain by the inimitable Robin Ożóg! That was the reaction of one audience member to Thursday’s first performance of The Sorcerer. 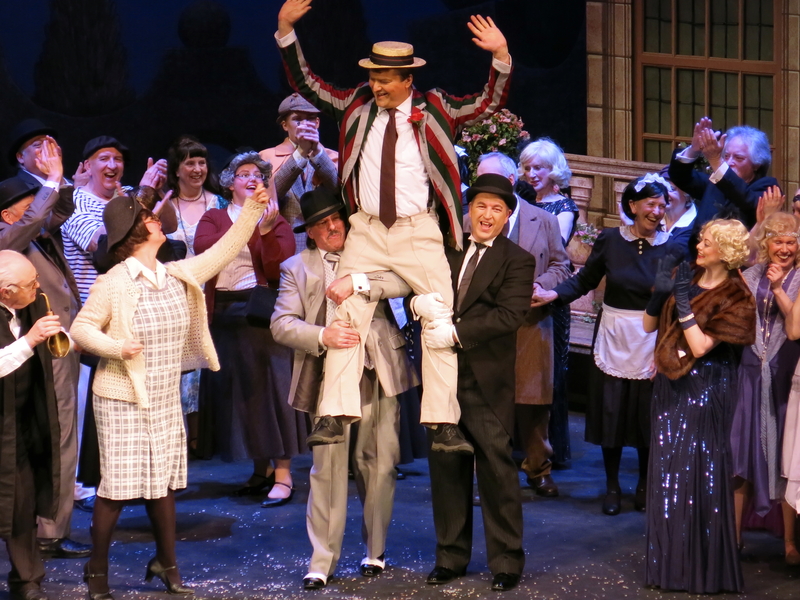 And last night’s performance had the extra ‘lift’ that comes from having an enthusiastic crowd in the hall – the cast respond well to laughter and clapping! If you want to see why young Alexis is being cheered on, and why the chorus look so individual, and what happens when “Love, the housemaid, lights the kitchen fire”, you’ll have to turn out this afternoon or this evening. Get there early, buy your ticket, have a drink in the bar, and enjoy a splendid evening’s entertainment! So that’s settled it … they’re officially betrothed, and the settlement paperwork has been signed; four ‘Roaring Twenties’ bridesmaids in the foreground; a handsome couple of fine singers arm in arm; proud father about to order the drinks … what could possibly go wrong? To find out, come to Carnegie Hall tonight, or on Saturday, when we’re on stage for both matinée and evening performances. 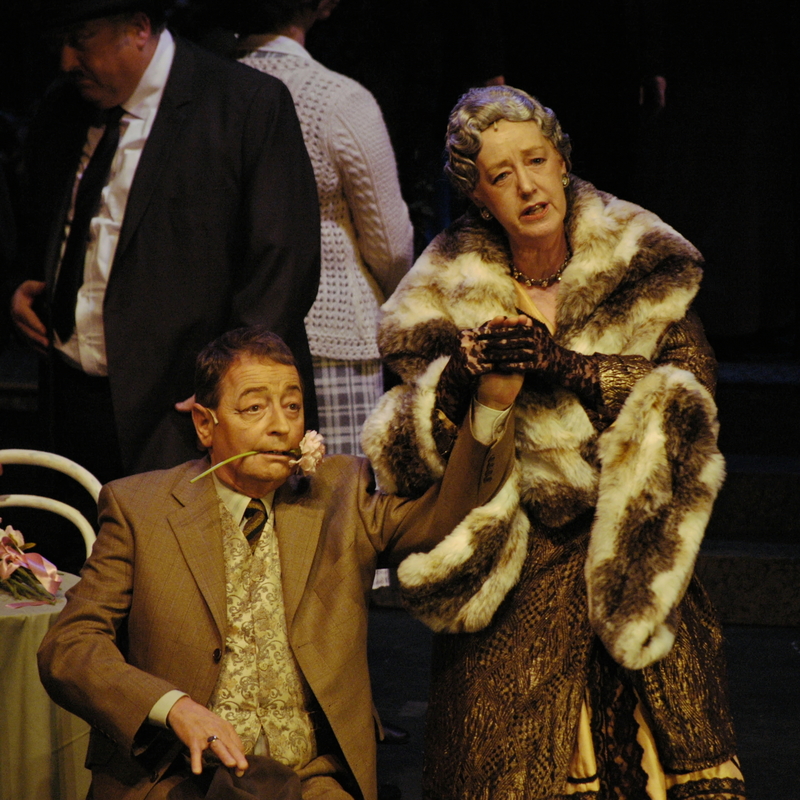 We may be enjoying the talents of some newcomers to the Society in this year’s production, but we also have years of experience in the two blue-blooded parts of Sir Marmaduke Pointdextre and Lady Sangazure. Encourage all your friends to come to see Robin Ożóg and Liz Landsman rekindle love in each other’s company. Or is it the warmth of her furs that excites Lady Sangazure’s passion?